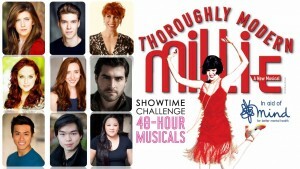 Showtime Challenge: 48-Hour Musicals - Announcing our female ensemble! Showtime Challenge / News / Announcing our female ensemble! We’re delighted to reveal that our female ensemble for #48HourMillie will be made up of the following talented actresses . . . They will be joined on stage by Amy Perry as Millie, Robert Colvin as Jimmy, Carly Thoms as Miss Dorothy, Suanne Braun as Mrs Meers, Will Kenning as Trevor Graydon, Joanna Reyes as Miss Flannery, Cletus Chan as Ching Ho, Andy Yau as Bun Foo and West End star Anna-Jane Casey as Muzzy . . . and many, many more! Showtime Challenge: 48-Hour Musicals’ one-night-only production of Thoroughly Modern Millie is coming to the Adelphi Theatre on 20 March 2016. An all-singing, all-dancing production, featuring full cast, choreography and orchestra. Rehearsed in just 48 hours, with proceeds to the charity Mind, this promises to be the West End’s most thoroughly-exciting night of the year. Tickets available here. More cast announcements coming soon . . . Announcing a New Show for 2019! on performances, auditions and tickets. Website designed by Simon Wilkes.